Coriander seeds and cilantro are two of my favorite ingredients, but I’ve always found it curious how little they taste like each other given that they’re from the same plant. This past weekend, though, while visiting a friend in Dorset, Vermont, I discovered the missing link: fresh green coriander seeds. They were growing on bolted plants in an herb garden, and I was amazed by their flavor, which tasted equally of the fresh green herb and dried spice. Well-stocked with alcohol (and not much else), we decided to experiment by muddling the green seeds in vodka and letting it infuse for a few minutes, then mixed it with a little lemon juice and simple syrup over ice. 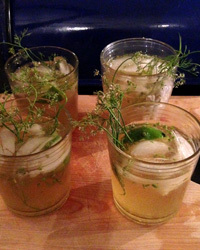 It made a pleasantly refreshing, herbaceous summer cocktail. Now that I’ve tasted them, I’m kind of surprised that green coriander seeds aren’t more widely available—they’d be so fun to play with. I might try mixing them into beef tartare next…but first I may have to start growing my own coriander from seed.